NYSE Finds Romance In Germany; Will It Work? The company that owns Germany's largest stock market is talking merger with the owner of the New York Stock Exchange. 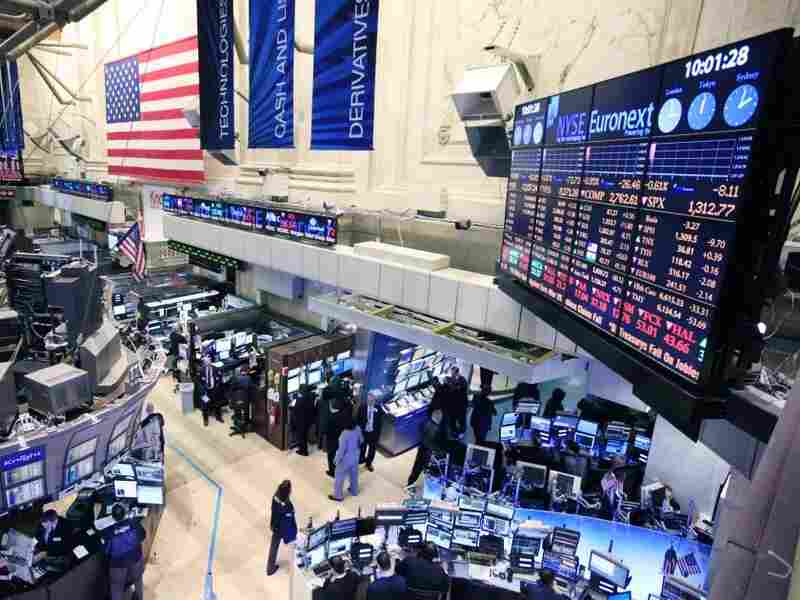 Changes in technology have diminished the NYSE's role in the capital markets. Experts say a merger could help keep it relevant. Traders work at the New York Stock Exchange on Thursday as a merger with the German exchange, Deutsche Boerse, moved forward. The New York Stock Exchange has long been the symbol of American financial might. But sometime soon, it could end up the property of a German company. The company that operates New York's leading stock exchange said Wednesday it's in talks to merge with the owner of the Frankfurt stock exchange. The deal is being driven by changes in technology that have diminished New York's role in the capital markets. The changes that have taken place in the financial markets have happened so fast that a lot of people may not even be aware they've occurred. Money manager Michael Holland says the changes have had a huge impact on traditional stock exchanges like the NYSE. "The nature of the securities business ... has changed so dramatically over the past 10 or 20 years," Holland says. "What used to be a very profitable business is now [a] razor-thin margin business." At one time, the NYSE handled most of the stocks traded in the United States. But lately it's had to do battle with electronic exchanges that have slowly stolen away business. Arthur Levitt, who was chairman of the Securities and Exchange Commission in the 1990s, says this has meant a declining role for the exchange and for U.S. capital markets as a whole. "We've always accepted the notion that the United States was the premiere economic market in the world and that anyone who sought a listing had to list in New York. ... That obviously is no longer the case," Levitt says. The politicians will fulminate about local sovereignty. But we can no longer take the economic supremacy of the United States for granted. This is a global market and we need global exchanges." The explosion of technological changes has allowed other cities like London to build up their markets at the expense of the United States, he says. The NYSE merger with Deutsche Boerse is an attempt to respond to these threats, Holland says. "If they get together, it will be the largest stock exchange/bourse in the world and should have the most efficient and lowest-cost production of what they do," he says. But the merger would also change things for the NYSE. It will still be the largest stock exchange, at least for a while, but it would be part of a much bigger company controlled by Deutsche Boerse. Charles Jones, a finance professor at the Columbia Business School, says that may be a little hard for some Americans to accept. "There is a little bit of nationalism that may come into this," he says. "It's giving up a little bit of sovereignty to have your stock exchange merge with another national stock exchange." But Jones says he thinks Americans will gradually come to terms with the changes. Levitt, the former SEC chairman, says in the long run Americans may have no choice. "The politicians will fulminate about local sovereignty," he says. "But we can no longer take the economic supremacy of the United States for granted. This is a global market and we need global exchanges." Levitt thinks the merger will probably go through for another reason: In the past, stock exchanges were set up as associations of members. The structure was a bit like a club, and they were often resistant to change. But in recent years, most exchanges, including the NYSE, have become for-profit companies that have to answer to their shareholders. And Levitt says they can't afford to stand still. "I think in the absence of this I would worry about the future of the New York Stock Exchange, because somebody on both sides of the water will be merging, and that could make the New York Stock Exchange largely irrelevant if they don't stay on top of it," he says. For this reason, Levitt says regulators on both sides of the Atlantic will probably end up approving the deal. There was a time regulators balked at the idea of allowing exchanges to get too big — arguing that it would be bad for competition. But with technology creating so many new ways to trade, that's no longer seen as much of a threat.